Please check your dog's size first before make order,Make sure the clothes fit your dog. we supply discount and fashion pet clothes, high quality of this kind of goods.Soft and breathable cotton fabric bring dog comfortable wearing experience, however, cotton material will shrink a little after washed, if your measurements approach the upper end of the range given for size chart, larger sizes maybe more suitable for your dog. Besides, it’s better to wash shirts with cold water which may decrease shrink. Our t-shirt fabric is post-dyeing finished fabric purchased directly from the manufacturer. We do not suggest any re-dyeing after your purchase, and can not guarantee your satisfaction after re-dyeing as well. Please give it a careful thought before purchasing. We do not accept any return or exchange of re-dyeing products. 1.) Chest: Measure girth around the broadest part of the chest. 2.) Back length: Measure length of pet's back from the base of neck to the base of the tail. 3. 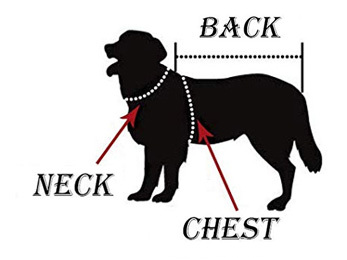 )Neck: Measure the circumference of pet's neck for a snug fit as you would with a collar. The most important is the chest size, so if the chest size is ok the other will not be big matter.